What I found were some dry goods that were similarly protein and fiber-packed, only larger, and more colorful—beans. Cool beans. If you’re an avid weird-food collector like me you might try this experiment sometime, and see what you end up with. One stool and a little searching is all it takes. Smoked sea salts? Awesome. Whole cardamom pods and seven-star dried peppers? Curry it up. Of course, once the beans were found, packages dusted off, I had to wait a while until those beans were softened, first by soaking then by cooking. But it was a refreshing turn of patience, since all I had to do on the Fourth was arrive with some sausages that I’d happened upon at a Polish deli in Greenpoint and throw them on the grill. Garlic scapes before roasting at 400 degrees. When I looked in my fresh-foods pantry (aka the refrigerator) I found some stuff from my CSA two weeks before that hadn’t been used up yet. Garlic scapes, those curly, green tentacles like Medusa’s head of snakes, attacked me from a plastic bag. They were still fresh and firm, to my surprise, and I’m sure that one or two pieces could have made for a nice, spring garlicky note in a dressing for bean salad. But I had so many of them. Used fresh, this would be way too overpowering. 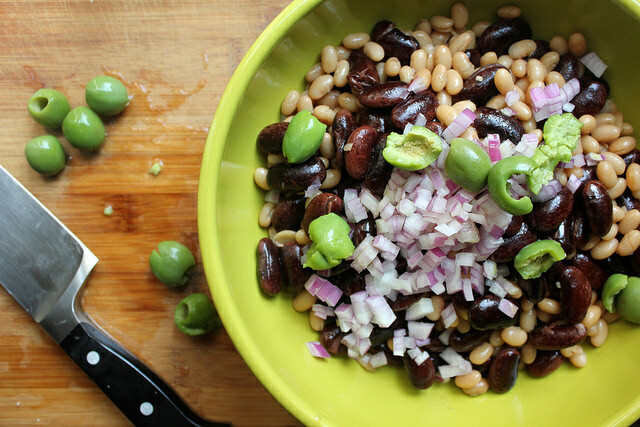 Bean salad is speckled with red onion and green olives. So I decided to roast them, whole. Then chop up the crispy tentacles into the salad. I also found some big, green olives, and thought they’d be a pretty, spring-colored pairing. They also bring a smack of brininess that gets absorbed into those beans the longer the salad sits. 1. Chop them up fresh to use in place of garlic cloves wherever called for. 2. Roast them whole until blistered and crisp, sprinkled with salt, pepper and olive oil to use as some sort of garnish. 3. Place them in a tall vase for decoration, like green bamboo shoots. So here’s to #2. And to a wholesome, healthful lunch post-summer barbecues. 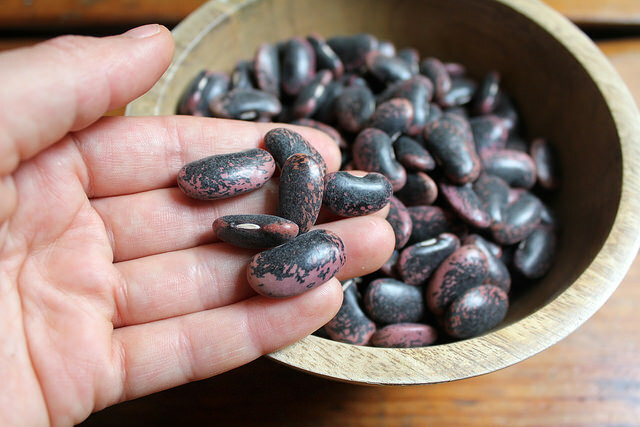 Soak each type of bean individually in at least 4 inches of water to cover overnight (or 4-6 hours). 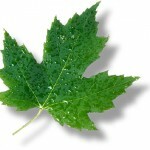 Rinse, then place each in a pot with 4 inches of water to cover. Bring each to a boil, then reduce heat to a low simmer and cover. Cook, covered, until beans are softened (around 40-60 minutes, depending on the bean). Drain and let cool completely. Preheat oven to 400 degrees. Toss the garlic scapes with 1 tablespoon of the olive oil and a couple pinches of salt and pepper. Spread out in a single layer on a baking sheet and roast until crisp, about 5-10 minutes. Remove from heat and let cool completely. Save the curlicue ends for garnish, and chop the remaining scapes to about 1/2-inch pieces. 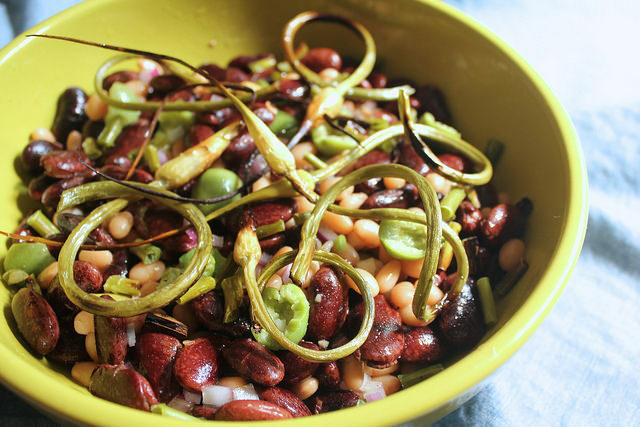 Combine the drained and cooled beans with the chopped onion, olives and chopped garlic scapes in a large bowl. Toss with the remaining olive oil, lemon juice, salt and pepper, and adjust seasonings to taste. 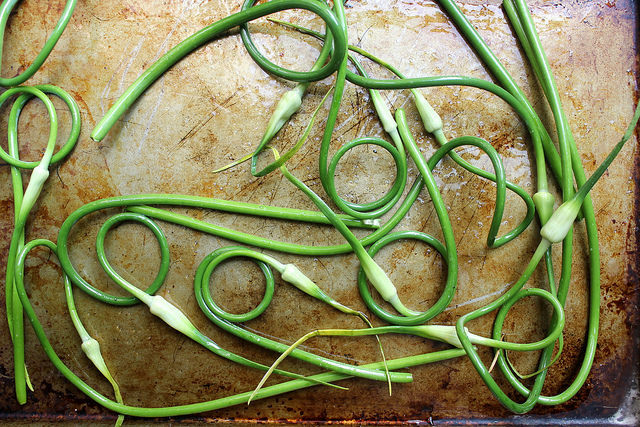 Serve with the curlicue pieces of roasted garlic scapes as garnish. Can be covered and chilled for up to 5 days. 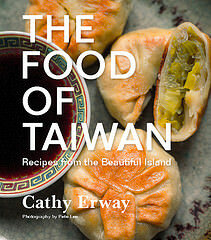 Three brownie points: This is the kind of recipe I do to make the health factor (and my healthfulness) get good marks. Whenever you’re in need of seriously healthy fix, make a bean and veggie salad, and it will cost you a fraction of the cost of a green smoothie. Plus, it’ll already have heart-healthy protein, fiber and carbohydrates and you won’t need any extra carbs (or dare we say meat) to meet your nutritional needs for the day. Screw the protein “boost.” Here it is, with dry beans. Eight brownie points: This is some high-energy food that’s low-carbon too. Being all plant-based, and the bulk of it stored from previous growing seasons if you’re using dried beans, you’re not counting on so many acres of grazing, calories in feed, and gallons in water for all that as with animal protein. And it’s a nice chore to use up some extraneous stuff like garlic scapes from a local farm or CSA when it’s in season, and not for long. For the pepper, I advice you to use Kampot pepper for flagrance.. so great.